Made by the industrial standard. It supports all major brands of photo equipment such as reflector, soft box, different lights, umbrella, background, etc. Spigot: 1/4″ (need adapter to convert to 3/8″). 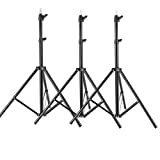 The light stand is made of aluminum alloy, making it strong for heavy duty work. It is also of light weight and can be folded into a small size, making it portable and easy to store after use. Its solid locking capabilities makes your lights safe. Made by the industrial standard. It supports all major brands of photo equipment such as reflector, softbox, different lights, umbrella, background, etc. It is perfect for photo studio and on site photo and video shoots! This entry was posted in Discount Photography and tagged 8.6Feet/260cm, Alloy, Aluminum, Light, Neewer, Photography, pieces, Reflectors, Softboxes, Stand, Tripod, Umbrellas by Ball Photo. Bookmark the permalink.